Lymphocyte activation culminates in blastogenesis, cell cycle progression, DNA replication and mitosis. These complex cellular changes are programmed almost simultaneously by multiple ligands and receptors that trigger specific signal transduction pathways and transcription factors. Until now, the discovery of the genes regulated by each ligand/receptor pair has been hampered by the technologies available. To identify interleukin-2 (IL-2)-responsive genes, human peripheral blood mononuclear cells (PBMC) were pre-activated with anti-CD3, rested, and restimulated with IL-2 for 4 hr. Gene expression was analyzed using Affymetrix U95Av2 oligonucleotide arrays. To determine the most stringent parameters to score a gene as a bona fide IL-2 target, the expression of 19 known IL-2-regulated genes was examined first. All were induced at least 2-fold, with a difference in fluorescent intensity of ≥ 100 at p < 0.05. An additional 53 unique genes met these criteria. To determine which of these were immediate/early IL-2 targets in T cells, purified T cells were stimulated with IL-2 for 4 hr in the presence of cycloheximide to prevent secondary gene expression. Of the 72 genes identified in PBMCs, 20 were detected as immediate/early IL-2-regulated genes in purified T cells. 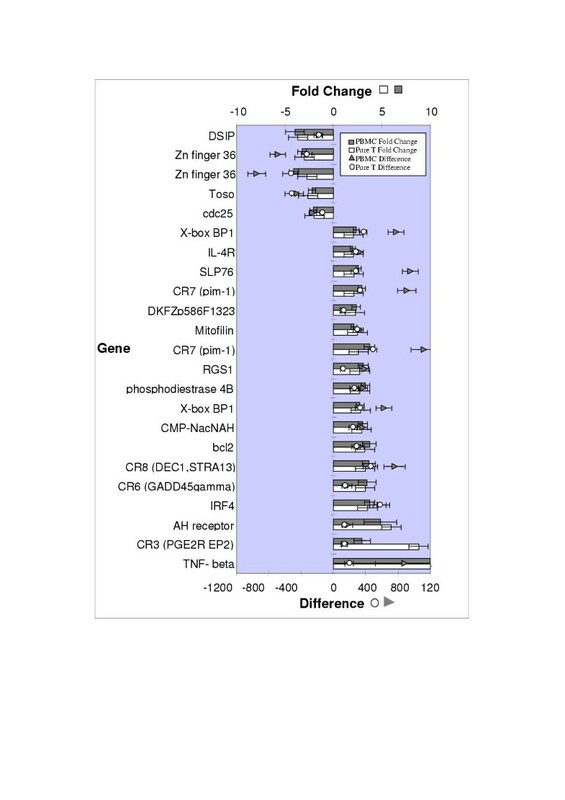 In addition, 27 unique genes were IL-2-regulated in T cells but not in PBMCs. For a successful reductionist approach to the analysis of gene expression in lymphocyte activation, it is necessary to examine purified cell populations and immediate/early gene expression regulated by each ligand/receptor pair involved. This approach should allow the discovery of genes regulated by all of the ligand/receptor pairs involved in lymphocyte activation. In 1960 Nowell first described lymphocyte activation by mitogenic lectins to result in "blastic transformation" and subsequent mitosis, which are complex cellular events that require several days to evolve . More than 40 years later, we have advanced considerably in our understanding of the cellular and molecular events responsible for these phenomena. Now with the genomic revolution, we are poised on a new threshold of discovery, in that it is finally feasible to begin to identify the genes that are responsible for such complicated cellular processes. However, it is now necessary to develop an experimental approach that will rapidly and accurately facilitate the discovery process. With the description of lymphocyte-derived growth factor activities in the 1960s and 1970s, it was realized that activated lymphocytes secrete soluble factors that are critical for subsequent lymphocyte proliferation [2, 3]. Moreover, in 1967 it was demonstrated that monocytes or macrophages serve as necessary accessory cells for the lymphocyte activation process . Then, in the early 1970s several reports indicated that mitogen- or endotoxin-stimulated macrophages release soluble lymphocyte activating factors (LAFs) that also amplify the activation process [5, 6]. Accordingly, lymphokines and monokines, which collectively came to be known as cytokines, became prime research subjects for those interested in lymphocyte activation [7, 8]. However, it was not until the 1980s that the cell surface and soluble molecules responsible for the complex cellular changes of lymphocyte activation were identified. With the isolation of the lymphocyte-derived molecule responsible for T cell Growth Factor (TCGF) activity, which came to be known as interleukin 2 (IL-2) [9, 10], and discovery of IL-2 receptors (IL-2R) , it could be shown that mitogenic lectins and specific antigens triggered an initial activation event, which was analogous to the activation of cell cycle "competence" by serum-stimulated fibroblasts, and resulted in transition from the G0 to the G1 phase of the cell cycle [12, 13]. However, just as in serum-stimulated fibroblasts, this initial activation event did not result in lymphocyte proliferation. Instead, it appeared that the initial activation of cellular competence triggered by the mitogenic lectins was amplified by the LAF activity, which became known later as IL-1, and led to the secretion of the lymphocyte-derived IL-2 and the expression of IL-2Rs [14, 15]. The subsequent interaction of IL-2 with the IL-2Rs then stimulated blastic transformation and progression through G1 and into the S phase of the cell cycle, followed by mitosis . Furthermore, detailed studies indicated that successful activation of the IL-2R is a quantal (i.e. all-or-none) event that depends on surpassing a threshold of a finite number of IL-2-IL-2R interactions [13, 17, 18]. This threshold corresponds to surpassing the "restriction (R) point" in the mid to late G1 phase of the cell cycle, first described by Pardee for serum-activated fibroblasts . Accordingly, activation of lymphocyte proliferation was realized to require at least 3 signals, one delivered to the T cell via the lectin, another supplied as a soluble factor by accessory macrophages, and a third contributed by the IL-2/IL-2R interaction. With the discovery of the T cell antigen receptor (TCR) in 1983 [20–22] it was possible to demonstrate that the first signal is delivered via antigenic activation of the TCR . Subsequently, discovery of accessory "co-stimulatory" molecule expression by "helper" T cells (Th), revealed that activation solely of the TCR itself was insufficient to fully activate IL-2 gene expression and T cell proliferation. Instead, in the mid '80s it was found that the activation of co-stimulatory molecules like CD28 expressed by T cells via ligands such as B7 expressed by antigen presenting cells (APC), deliver additional signals that synergize with those emanating from the TCR, and result in maximal IL-2 gene transcription . As well, CD28 activation stabilizes IL-2 mRNA transcripts, prolonging IL-2 mRNA life span . Thus, in addition to soluble macrophage-derived products, cell surface molecules expressed by APCs also contribute to the 2nd signal attributed to the APCs. The molecules responsible for the contribution by the soluble macrophage-derived LAFs still remain obscure, even today. Initially the nomenclature of IL-1 and IL-2 was created to delineate the sequential action of an assumed single macrophage-derived soluble factor (IL-1), which promoted the production of a single lymphocyte-derived factor (IL-2) [14, 15, 25]. However, the molecular nature of the LAF activity was never fully elucidated, even after the isolation and identification of multiple mitogen/endotoxin-stimulated macrophage-derived products, such as IL-1, IL-6, IL-12, IL-18, and Tumor Necrosis Factor-alpha (TNF-α). It is probable that all of these macrophage-derived soluble factors together make up the activity originally ascribed to LAF. Accordingly, it is obvious that addition of a polyclonal activating ligand such as phytohemagglutinin to peripheral blood mononuclear cells (PBMCs) leads to the activation of soluble macrophage-derived and lymphocyte-derived activating factors, and the almost simultaneous activation of multiple cell surface receptors, signaling pathways and transcription factors that ultimately all contribute to lymphocyte activation. Stimulation of the various receptors expressed by T cells and APCs results in the activation of distinct and also redundant signal transduction pathways, and in the activation of distinct as well as redundant transcription factors. Accordingly, it has been assumed that triggering any of these receptors should result in the expression of distinct as well as redundant cellular genes. Until recently the identification of large numbers of genes triggered by distinct ligands has been difficult, owing to the cumbersome methods available for gene identification. Cochran and Stiles were among the first to use differential cloning methods to identify PDGF-regulated genes in fibroblasts . These investigators focused on the expression of immediate/early PDGF-stimulated genes, by activating the cells in the presence of inhibitors of protein synthesis such as cycloheximide, thereby preventing the expression of secondary genes. Subsequently, Zipfel and co-workers employed subtractive hybridization to isolate and differentially clone immediate/early genes activated via the T cell antigen receptor in the presence of cycloheximide . A total of 60 novel TCR-induced immediate/early genes were isolated, but most were not identified at the time, in that DNA cloning and sequencing methods were tedious and time consuming. New differential cloning methods were developed subsequently, including differential display , sulfhydryl labeling and affinity purification of newly-synthesized transcripts , representational difference analysis , and serial analysis of gene expression . Each methodological advance has improved both the sensitivity of detection of differentially expressed genes, as well as the speed with which the genes may be identified. However, the development of DNA microarray technology, which allows rapid interrogation of thousands of genes and the detection of gene expression at frequencies even less than 1 in 100,000, has now greatly facilitated such experimentation [32, 33]. This communication represents our initial efforts to use DNA microarrays in a reductionist approach to begin to identify the genes expressed as a consequence of triggering each individual ligand during lymphocyte activation. Because the IL-2/IL-2R interaction is discrete molecularly, and leads to a very finite, quantal decision to undergo blastic transformation, DNA synthesis and mitosis, we have focused our first efforts on identifying IL-2-regulated genes expressed by normal human T cells. Responses of PBMCs to IL-2 are complex, involving direct effects of IL-2 on gene expression by T cells, B cells and NK cells, as well as secondary effects mediated by additional cytokines and transcription factors expressed by these cells in response to IL-2. To identify the maximal number of IL-2-regulated genes, PBMCs comprised of ~80% CD3+ lymphocytes, with smaller fractions of monocytes, B cells and NK cells (Table 1) were examined. The cells were pre-activated for 72 hr with anti-CD3 to induce T cell IL-2 receptor expression, then washed and rested for 36–40 hr, prior to restimulation with IL-2 for 4 hr . Five independent experiments were performed with PBMCs from different donors to identify IL-2-regulated genes represented on the Affymetrix U95Av2 oligonucleotide array. A comparison was made between the pre-activated, rested cells, and those restimulated with IL-2 for 4 hr. The expression levels were analyzed using DNA-Chip Analyzer software , with normalization to the average chip signal intensity for each experiment, and a 10th percentile value cut-off for 'absent' genes. Approximately 45% of the ~12,600 probe sets were detected above background. Using the criterion of p < 0.05 for the difference of means between the two groups, a total of 316 of these ~5,800 probe sets (~5.4%) were identified as putative IL-2-responsive genes. A complete list of all IL-2-responsive genes identified in PBMCs and T cells can be found in the attached file 'IL-2-regulated genes'. The expression patterns of 19 genes already known to be IL-2-regulated, which were represented by 25 distinct probe sets on the array, were used to determine the range of expression parameters that might be most likely to identify bona fide IL-2-regulated genes (Table 2). As negative controls, glyceraldehyde-6-phosphate dehydrogenase (GAPDH) and actin were used as examples of genes that do not change expression levels under the experimental conditions used; their expression levels were indeed constant without or with IL-2 treatment (1.04 ± 0.06 and 1.06 ± 0.01 fold change, respectively). By comparison, the 19 selected genes showed IL-2-induced changes in expression levels, ranging from 2.0 ± 0.3-fold (IL-4R, probe set 404_at) to >80-fold (TNFβ 36296_at). The subtractive differences in fluorescent intensity ranged from 114 ± 20 (c-myb 1474_s_at) to >1000 (CR7 1779_s_at). Four of the genes (c-myb, CR7, flt3 ligand, TNF-β) were detected with more than one probe set, and these replicates were in fairly good agreement. It is worthy of note that there is not a correlation between the subtracted difference and the fold change in gene expression levels. This is likely due to the fact that there is a wide range in the abundance classes of RNA transcripts derived from different genes, from as few as 1 copy per cell to several thousand copies per cell . The signal intensity of a particular transcript detected on an oligonucleotide array would thus be directly related to this abundance level. Therefore, the subtracted change in signal intensity would be profoundly affected by the absolute number of cellular copies of a given transcript. By comparison, the fold induction is independent of absolute transcript copy number. Based on the results obtained with known IL-2 target genes, the criteria used to identify additional bona fide IL-2-regulated genes in these samples were set at ≥ 2-fold change, with a subtracted difference in fluorescent intensity ≥ 100, and a significance level of the difference between the means of the two treatment groups of p < 0.05. Of the 316 probe sets that met the standard of p < 0.05, 251 (79%) also met the additional criteria of either fold change ≥ 2, or subtracted difference ≥ 100, while only 84 probe sets (27%) met all three criteria. These 84 probe sets represent 72 unique genes (60 IL-2-induced genes and 12 IL-2-repressed genes) that can be segregated into 8 functional groups. Figure 1 shows the fold induction and subtracted differences in expression levels of these probe sets. Among the 4 apoptosis-regulating genes, bcl2, caspase 3 and DRAK2 are all induced by IL-2, while the expression of Toso is suppressed. It is noteworthy that the IL-2 induction of bcl2 would be expected to promote cellular survival, while the IL-2 regulation of the other three genes would be expected to promote apoptosis. 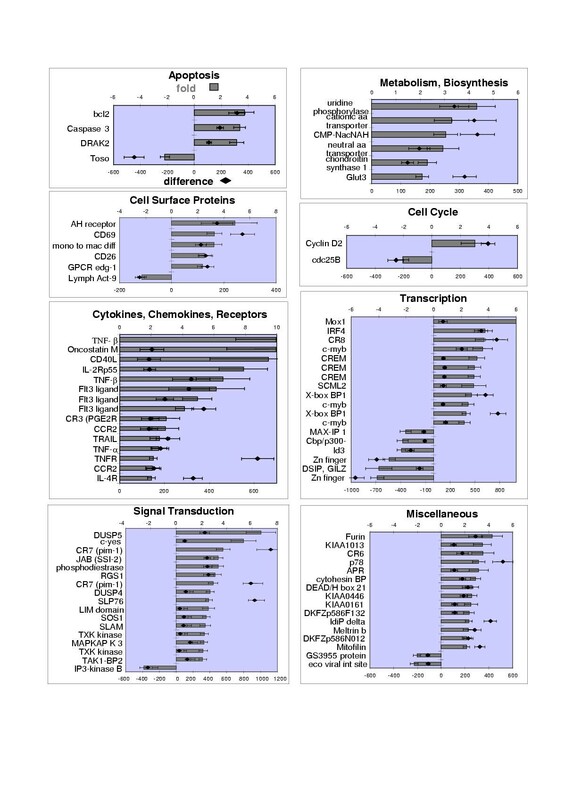 Additional IL-2-responsive genes include those encoding 6 cell surface proteins, 11 cytokine and chemokine receptors, as well as 15 signal transduction mediators, 6 genes involved in cellular metabolism and biosynthesis, 3 cell cycle regulators and 12 transcription factors. IL-2-suppressed genes include lymphocyte antigen 9, inositol 1,4,5-trisphosphate 3-kinase B, and cdc25B, as well as transcriptional regulators MAX-interacting protein 1, CBP/p300-interacting transactivator, inhibitor of DNA binding 3 (Id3), glucocorticoid-induced leucine zipper (GILZ), and zinc finger protein 36/ERF-2. All of the 19 already known IL-2-regulated genes (Table 2) were also identified in this 72-gene cohort, thereby yielding 53 newly identified IL-2-regulated genes expressed by PBMCs after 4 hours of IL-2 stimulation. IL-2-regulated genes in PBMCs. Pre-activated, rested human PBMCs were left untreated or restimulated for 4 hr with IL-2, and RNA probes were prepared for hybridization with Affymetrix U95Av2 arrays. A total of 84 probe sets were identified that showed fold change ≥ 2 (columns, left axis), subtracted difference ≥ 100 (diamonds, right axis), and a significance value of the difference between the means of p < 0.05. The probe sets represent 72 unique genes, and can be segregated into 8 functional groups. The PBMC populations used in our initial experiments included NK cells, monocytes and B cells, as well as T cells. In addition, cytokines including TNFα, TNFβ and flt3 ligand were induced by IL-2 as detected by the arrays, so that the IL-2 effects could be mediated by the action of these intermediary cytokines on other cells in the mixed population, or as well, by the 12 transcriptional targets activated by IL-2. Therefore to identify the direct IL-2 targets in T cells, we used CD56-depleted, CD2-selected T cells, which were 94 ± 1% CD3+ cells. The PBMCs were pre-activated with anti-CD3 for 72 hr, the T cells purified, and rested for 36–40 hr prior to restimulation for 4 hr with 1 nM IL-2. In addition, 10 μg/mL cycloheximide (CHX) was included to block protein synthesis, so that only immediate/early IL-2-regulated genes were detected. CHX has been shown to both elevate and prolong the expression of many transiently induced transcripts [26, 29], so that the 4 hr IL-2 stimulation in the presence of CHX should enable detection of genes induced within minutes as well as hours. Samples from 4 independent experiments with pre-activated, rested cells, or cells treated with CHX alone were combined for data analysis, and compared to cells treated with IL-2 ± CHX. As depicted in Figure 2A, using only the criterion of significance level of p < 0.05 for the difference between the means of the two groups, 449 probe sets were identified as IL-2-regulated immediate-early targets in the pure T cells. Of these probe sets, 110 were also detected in the IL-2-stimulated PBMCs. As shown in Figure 2B, when a second standard was included, either a fold change ≥ 2, or a subtracted difference ≥ 100, 161 probe sets (36%) were expressed as immediately/early genes in purified T cells, and of these, 71 were also IL-2-regulated in PBMCs. However, when all 3 criteria were applied (Figure 2C), a total of only 52 probe sets (12%) were found to be immediate/early, IL-2-regulated genes in T cells. Twenty-three of these 52 probe sets were among the 84 probe sets identified previously as meeting all 3 criteria in the experiments with PBMCs (Figure 3). By comparison, the control genes actin and GAPDH showed 1.1 ± 0.1 and 1.3 ± 0.2-fold change, respectively. IL-2-responsive probe sets in PBMCs and purified T cells. (A). Using the criterion of p < 0.05 for the difference between the means of IL-2-treated and untreated groups, a total of 316 IL-2-sensitive probe sets were identified in PBMCs (left circle), and 439 in purified T cells (right circle). Of these, 110 were identified in both cell populations (overlap between circles). (B). When a second standard of either fold change ≥ 2 or subtracted difference ≥ 100 was included in the analysis, 251 probe sets were identified in PBMCs, and 161 in pure T cells, with 71 in common. (C). When all three criteria were used, 84 probe sets were identified in PBMCs, 52 in T cells, and 23 of these were common to both populations. Within each population, the percentages of IL-2- suppressed and induced probe sets are indicated. IL-2-regulated genes in PBMCs and purified T cells. A total of 23 probe sets met all three expression criteria of fold change ≥ 2 (columns, left axis), subtracted difference ≥ 100 (diamonds and circles, right axis), and p < 0.05 in both PBMCs and purified T cells. These probe sets represent 20 unique genes. The 23 probe sets represent 20 IL-2-regulated immediate/early genes. Therefore, only ~1/3 of the genes discovered to be IL-2-regulated in PBMCs are actually immediate/early direct IL-2 targets in T cells. These direct IL-2 immediate/early target genes included 4 genes that were suppressed, DSIP/GILZ, the zinc finger protein 36/ERF-2/Tis11d, Toso, and cdc25B. Notably, of the 16 IL-2-induced genes, we had already been identified 4 previously as IL-2 targets using differential colony hybridization (CR3, CR6, CR7, CR8) , while the 3 other known IL-2 stimulated target genes included TNFβ, the IL-4R, and the anti-apoptotic gene, Bcl2. Thus, only 9 genes were newly identified as IL-2-induced immediate/early T cell genes; including the signaling proteins SLP76 and RGS1, the transcription factors IRF4 and XBP1, and 5 miscellaneous genes (DKFZp586F1323, mitofilin, cAMP-specific phosphodiesterase 4B, CMP-N-acetylneuraminate monooxygenase, and the aryl hydrocarbon receptor). In addition to the 23 probe sets in common with those identified in PBMCs, 29 others were detected as IL-2-regulated immediate/early targets in the purified T cells (Figure 2C). These probe sets met all three of the criteria of ≥ 2-fold change, subtracted difference ≥ 100, and p < 0.05 in T cells, but were not IL-2-regulated in PBMCs. These probe sets represent 27 unique genes, and are presented in Figure 4. Notably, only three of these were induced, while the remaining 24 were all suppressed in response to IL-2 + CHX. IL-2-responsive genes in purified T cells. 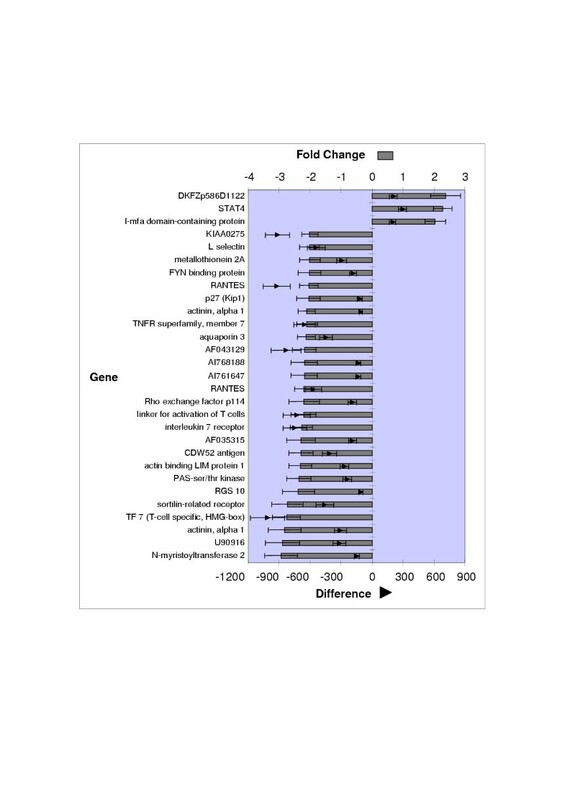 A total of 29 additional probe sets met all three expression criteria of fold change ≥ 2 (columns, left axis), subtracted difference ≥ 100 (diamonds and circles, right axis), and p < 0.05 in purified T cells, but did not meet all three criteria in PBMCs. These probe sets represent 27 unique genes. Of the remaining 61 probe sets identified in PBMCs (Figure 2C), 31 showed changes in expression levels in T cells with p < 0.05, although either the fold change was less than 2.0, or the magnitude of the change was less than 100 (Table 3). These 31 probe sets are derived from 27 unique genes, and most likely represent bona fide IL-2 targets, since the group includes the genes JAB/SSI-1/SOCS-1, flt3 ligand, IL-2Rp55, caspase 3, and p78, which have already been reported as IL-2-induced genes. If these genes are also included, 47 of the 72 unique genes (65%) identified in PBMCs are IL-2-regulated immediate/early genes in pure T cells. 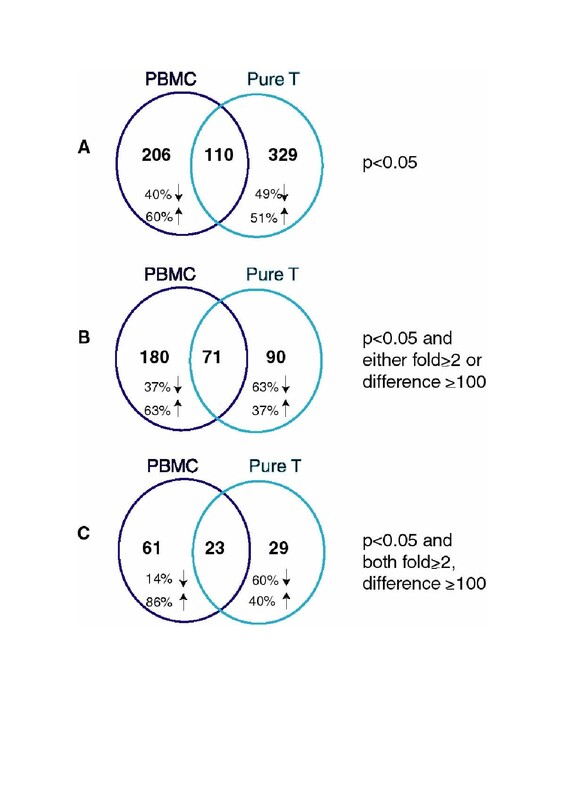 Similarly, of the 29 probe sets identified as meeting all 3 criteria only in pure T cells, 7 showed differences in expression with p < 0.05 in PBMCs (Table 4). These include linker for activation of T cells, T-cell-specific transcription factor 7, STAT4, IL-7R, PAS ser/thr kinase, l-mfa domain-containing protein, and an unknown gene designated DKFZp586D1122. Notably, all of the other genes (22) were suppressed by IL-2 in the PBMCs, as they were in the T cells, although they did not meet the significance value of p < 0.05 in the PBMCs. Lymphocyte activation is initiated by specific antigen/receptor interactions, and aided by accessory molecules. However subsequently, cytokine and cytokine receptor expression ensue, and the cytokines ultimately drive the clonal expansion and functional differentiation of the antigen-selected lymphocyte populations. IL-2 was initially identified by virtue of its T cell growth factor activity, and IL-2 is now recognized as the pivotal cytokine in promoting mature peripheral T cell proliferation [36, 37]. Therefore, to initiate the identification of the genes responsible for lymphocyte activation, we chose first to delineate the genetic mechanisms of IL-2 action. Using oligonucleotide arrays of known genes to identify IL-2-regulated genes in human lymphocytes, a total of 72 unique genes were found to change expression within 4 hr of IL-2 stimulation of PBMCs. These genes could be segregated into functional groups, including cell surface proteins, cytokine and chemokine receptors, as well as signal transduction mediators, cytokines, genes involved in cellular metabolism and biosynthesis, cell cycle regulators and transcription factors. In order to define the criteria that we used to sort the microarray data in this series of experiments, we were able to take advantage of previous reports of 19 known IL-2-regulated genes. By assessing the characteristics of the changes in expression of these known IL-2 targets, we were able to define a range of both fold-induction and subtracted difference that encompassed all of these genes. When applied to the total data set, these criteria were likely to identify additional meaningful IL-2-regulated genes. Since 19 of these genes had already been reported to be IL-2-induced genes, our DNA array experiments identified 53 additional IL-2-regulated genes expressed by PBMCs. However, only 20 of these genes were found to be IL-2-regulated immediate/early T cell genes. It is important to discriminate these results from other analyses of T cell activation that have employed antigen receptor activation, as opposed to IL-2. The TCR and IL-2 receptors activate some shared signaling pathways, such as the Ras-Raf-MAP kinase and PI-3-kinase pathways . However, there are differences, such as the Jak-Stat pathway, which is unique to the cytokines , and the Ca++/Calcineurin pathway, which is activated by the TCR. These signaling pathways culminate in the activation of specific transcription factors, so that there must be both shared target genes, as well as genes unique to antigen or IL-2 signaling. As TCR signaling induces the expression of IL-2, as well as other cytokines and their receptors, the ultimate T cell response is an amalgam of both antigen- and cytokine receptor-triggered events. This point is well illustrated by the report of Teague et al , who used microarrays to identify murine T cell genes induced in vivo by SEB stimulation after 8 and 48 hours. Again, cytokine and cytokine receptor genes were induced during these time intervals, so that the entire spectrum of genes identified included both antigen- and accessory molecule-activated, as well as cytokine-regulated targets. Similarly, Ellisen et al  used DNA arrays to monitor ConA-induced genes in human T lymphocytes, over a time scale ranging from 4 to 48 hours. Inducible genes included IL-2 and TNF-α, as well as the IL-1R, IL-2Rα and IL-4R. Thus, at the time points used in this study, many of the genes detected were likely regulated by these cytokines as well as Con A. In a similar vein, Herblot et al  used a subtractive approach to identify 66 genes induced by IL-2 but not IL-4 in a murine T cell line. They further demonstrated that while in vitro, ConA could induce expression of the IL-2 target genes in T cells from IL-2 +/+ mice, the genes were not induced by ConA treatment of T cells from IL-2-/- mice. Thus, ConA induces IL-2 and IL-2R expression, and the cytokine drives expression of additional specific target genes. Recently, Riley et al  and Diehn et al  described genes regulated by the TCR and the costimulatory receptors CD28, ICOS and CTLA-4, over a time course of 1–48 hours. Once again, numerous cytokines, including IL-2, are strongly induced within 2 hr, such that a number of the observed regulated genes are likely cytokine-responsive targets. Finally, Gonzalez et al  have described murine genes induced after 8 hr IL-2 stimulation, which likely include direct targets of IL-2, as well as genes induced via IL-2- regulated cytokines. Therefore, to discriminate between the distinct genes induced by each ligand that contributes to the overall response initiated by antigenic stimulation, it is important to use cycloheximide to identify immediate/early genes regulated by the TCR and costimulatory receptors vs. IL-2. In addition, the genes activated by TCR, costimulatory receptors and IL-2 must be distinguished from those activated by IL-1, IL-6, IL-12, and TNF-α, as well as the genes regulated by the Toll-like receptors (TLR), all of which have been identified as mediators of lymphocyte activation events that were previously ascribed to LAF. Moreover, as IL-2 itself induces the expression of numerous cytokines and receptors, it is important to discriminate the direct IL-2 targets from those induced secondarily through these intermediaries. Thus, it is worthy of re-emphasis that of the 72 genes regulated by IL-2 in PBMCs, only 20 were found to be bona fide IL-2-regulated immediate/early genes in purified T cells. In addition to imparting positive activating signals that result in cell cycle progression, IL-2 has also been found to promote negative feedback phenomena. Thus, it is especially intriguing that IL-2 suppresses the expression of many genes, both among PBMCs in the absence of CHX, as well as in purified T cells in the presence of CHX. The suppression of the expression of these genes may well be important in mediating the feedback down-regulatory phenomena. The high-affinity IL-2 receptor is comprised of three subunits, α, β and γ [46, 47]. The α chain is specific to IL-2, while the γ chain is shared among IL-4, IL-7, IL-9, IL-15 and IL-21 . The β chain of the IL-2R is also a component of the IL-15 receptor, in conjunction with a specific IL-15R α chain . The sharing of these receptors by multiple cytokines raises the question of how the ligands can trigger specific responses in the target cells. Several signaling events, including the activation of Jak kinases 1 and 3 are shared among the 'common γ chain' cytokines . Other signaling events, such as the activation of Shc, Gab2, SHP-2 and MAPK, are shared among IL-2 and 15, but not the other common γ chain cytokine receptors, and Tyr 388 of IL-2Rβ appears critical for these events . Despite these signaling similarities, it is clear that the biological properties of IL-2 are unique among the common γ chain cytokines, as the other cytokines cannot compensate for IL-2 in the IL-2 knockout mouse . In addition, IL-15 appears uniquely critical for the development of NK cells, as evidenced by the phenotypes of IL-15  and IL-15R α  deficient mice. Thus, there must be a means whereby IL-2 and IL-15, as well as the other common γ chain cytokines, trigger distinct intracellular signaling pathways, and target genes. Therefore, identification of each of the cytokine-specific target genes should shed light on the issue of specificity amongst the common γ chain cytokines. Complete classification of the genes expressed as a consequence of distinct ligand/receptor interactions during lymphocyte activation will also provide a powerful tool for the assessment and treatment of immunological disorders . In addition to defining the target genes of specific cytokines and cell surface ligands, it is possible to further subdivide the genes based on the specific signaling proteins and transcription factors that govern their expression. For example, through the use of STAT5-/- mice, Ihle et al have been able to identify those IL-2 target genes that require STAT5 [56, 57]. Similar approaches with mutant signaling proteins, knockouts, or over-expression systems enable such dissection of the signal transduction pathways leading to specific target genes. Thus, each ligand/receptor pair will ultimately be linked to a specific signature of target genes, derived from the signaling pathways and transcription factors activated. Such information will be invaluable in the diagnosis and treatment of disorders involving aberrancies in these pathways. The rapidity with which lymphocyte activation genes may now be identified using the methods described in this report opens the way to a molecular genetic definition of the immune response, based upon the categorization of the genes regulated by distinct ligand receptor pairs. Consequently, more precise genetic and molecular diagnoses of immune disorders will soon become available, and hopefully, new treatment regimes may be developed to target the specific molecular nature of each disease. Human peripheral blood mononuclear cells (PBMC) were purified from venous blood of healthy donors by density centrifugation over Histopaque 1.077 (Sigma). Cells were cultured in RPMI1640, 10%FCS, at a density of 1 × 106 cells/ml, and activated with anti-CD3 (OKT3, 1:500; Ortho Diagnostics). After 72 hr activation, PBMC were washed and replaced in culture without stimulation for 36–40 hr prior to restimulation with 1 nM IL-2 . To purify T lymphocytes, 72 hr OKT3-activated PBMC were depleted of CD56, and positively selected for CD2, using antibody-conjugated magnetic beads (anti-CD56 Polysciences Inc, anti-CD2 Dynal) according to manufacturer's instructions. Subsequent to purification, T cells were replaced in culture for 36–40 hr prior to restimulation with 1 nM IL-2, and/or 10 μg/ml cycloheximide. Cell populations were stained with anti-CD3-APC, CD14-FITC, CD19-PerCP and CD56-PE (Becton Dickinson), and quantitated by flow cytometry (FacsCalibur, Becton Dickinson). Five independent experiments were performed with PBMCs from different donors, and four independent experiments were carried out with purified T cells. Protocols for sample preparation and array hybridization are from Affymetrix. Briefly, total cellular RNA was prepared with Qiagen RNeasy reagents, and 5 μg samples were used to prepare T7-dT-primed double-stranded cDNA (SuperScript Choice, Invitrogen). Biotin-labeled cRNA was prepared by in vitro transcription (BioArray High-Yield T7, Enzo), and hybridization cocktails were prepared with 20 μg cRNA per sample. Hybridization, wash, and staining of Affymetrix human U95Av2 arrays were performed following manufacturer's instructions. Data analysis was performed with DNA-CHIP Analyzer software [34, 58]. Gene expression values were normalized to the average chip signal intensity for each experiment, and a 10th percentile value cut-off was used for 'absent' genes that did not give signals significantly greater than background. To calculate IL-2-induced gene expression changes, the subtracted difference values were determined by subtracting the signal intensity of untreated samples from the values of IL-2-treated samples. The fold difference was calculated as (IL-2-treated)/(untreated). Standard errors were derived from 5 independent PBMC experiments, and 4 experiments with purified T cells. The average of the standard errors relative to the mean expression values (SE/mean signal intensity)*100% was 22% for untreated and 15% for IL-2-stimulated PBMCs, and 16% and 19% for the unstimulated and IL-2-treated purified T cell samples, respectively. The p-values were determined by testing whether the absolute difference between treatment group means is not zero by unpaired t-test. This work was supported by National Institutes of Health NIAID grants RO1 AI 32031-24 and RO1 AI 44207-02. The results reported here represent almost 20 years of effort. K.A.S. initiated the search for IL-2-regulated genes in 1983, using subtractive hybridization, and reported the first IL-2-regulated gene in 1986 . C.B. extended these initial efforts and reported on the identification of 8 immediate/early IL-2-induced genes in 1993 . C.B. conceived and performed the experiments contained in this report, and wrote the manuscript. K.A.S. provided advice in experimental design and analysis of the results, and contributed to the revisions of the manuscript that eventually resulted in the final version.